As Executive Vice President and Chief Human Resources Officer, Amber Howe is responsible for leading and driving people strategies to support Beacons business priorities. She oversees the HR function with professionals responsible for training and leadership development, talent acquisition, compensation and benefits, wellness, employee relations and performance management. Amber also serves as a senior-level advisor to executives and employees regarding human resources trends and issues. 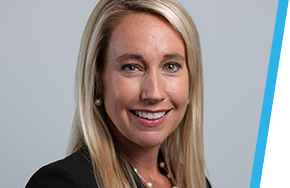 Prior to joining Beacon, Amber served as Senior Vice President of Human Resources at Santander Bank, one of the country’s largest retail banks. Amber has also held similar human resources leadership positions at TD Bank and Citizens Financial Group. Amber received her Masters of Public Administration in public administration and management from Grand Valley State University and her Bachelors of Science in social work/sociology from Calvin College.